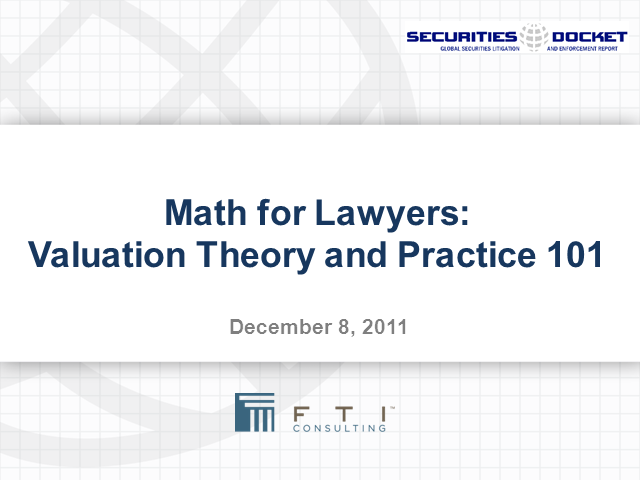 This webcast covers fundamental concepts of accounting and valuation focusing on issues that lawyers often encounter. This webcast will cover important valuation issues such as standards and premises of value, and will provide basic instruction on business valuation standards and approaches. Using several case studies, the panel will discuss the general standards that exist for valuation professionals, the three commonly utilized valuation approaches, cost of capital theories, valuation issues in a litigation, and more. The program is geared to lawyers involved in mergers and acquisitions and business disputes involving valuation. Please join panelists Jeff Litvak and Ken Mathieu, both of FTI Forensic & Litigation Consulting, as they address these issues and your questions in this free webcast.